After some mixed results yesterday, markets are trending higher today. 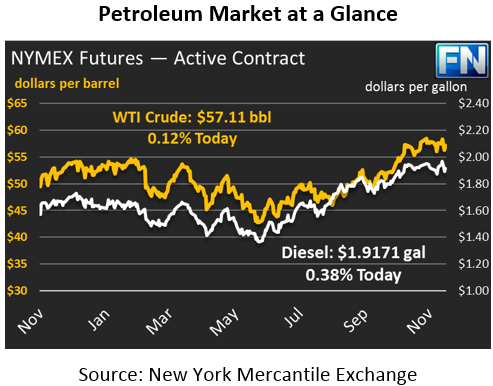 WTI crude oil saw 34 cent (0.6%) gains yesterday, and prices are sustaining this morning, picking up another 7 cents. WTI is currently trading at $57.11, which is $6.15 higher than Brent crude oil. Recall that Brent-WTI spreads have been a growing topic when it comes to exports, and the pipeline outage in the U.K. had further exacerbated the spread. Now, Brent-WTI spreads are back to their recent average near $6. Refined products moved in different directions. Diesel prices held onto small losses, dropping by just a quarter of a cent. Gasoline, on the other hand, picked up 1.7 cents, rebounding from the massive losses seen on Tuesday and Wednesday. This morning, diesel prices are rebounding, picking up .72 (0.4%) to trade at $1.9171. Gasoline prices are sustaining yesterday’s gains and continuing higher, rising 0.4 cents to trade at $1.6747. Although markets have calmed following the outage of the Forties Pipeline in the U.K., repair work continues on the pipeline. Each day, 300 thousand barrels of crude are not finding their way to the market, creating local outages. Companies operating in the North Sea have declared force majeure for the first time in 40 years. The IEA yesterday published their December Oil Market Report, which noted that 2018 could be a tough year for OPEC. While OPEC has held tightly to their cuts, other producers have grown their market share, and the IEA expects that trend to continue next year. Overall, the group expects a slightly oversupplied market in the first half of 2018, along with a slight under-supply in the second half of the year.